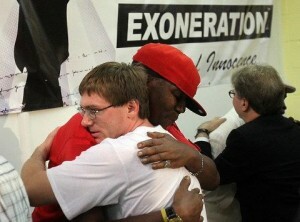 Derrick Jamison embraces new exoneree Damon Thibodeaux. Derrick Jamison, an innocent man who spent 17 years on death row in Ohio, will be a special guest at the 13th Annual March to Abolish the Death Penalty on November 3, 2012 at the Texas Capitol in Austin at 2 PM. He is a member of Witness to Innocence. Derrick Jamison was one of four exonerated death-row inmates ( along with Ray Krone, Shujaa Graham and Ron Keine) who went to Santiago, Spain to film a TV commercial featuring Coca-Cola’s sports drink Aquarius. They filmed for 6 days, sometimes for 18 hrs a day for these few seconds of air time. Coca-Cola says that their message reached hundreds of millions of people in Spain, Central, and South America. Three of the exonerees featured in the commercial will now be at the 11th Annual March to Abolish the Death Penalty on October 30 at 2 PM at the Texas Capitol in Austin. When James Suggs, an eyewitness to the robbery and murder of a Cincinnati bartender, was shown photo arrays of suspects by police, he identified two men—but neither of them was Derrick Jamison. There were also multiple contradictions between physical descriptions of the perpetrators given by witnesses and Derrick’s actual appearance. This information was withheld from Jamison’s trial, and as a result, an innocent man spent nearly 20 years on Ohio’s death row for a crime he did not commit. In February 2005, Ohio Common Pleas Judge Richard Niehaus dismissed all charges against Derrick after his conviction was overturned three years earlier. Jamison was convicted and sentenced to death in 1985 based largely on the testimony of Charles Howell, a co-defendant whose own sentence was reduced in exchange for testimony against Derrick. Statements were withheld that contradicted Howell’s testimony, undermined the prosecution’s explanation for the death, and ultimately would have incriminated other suspects for the murder. Two federal courts ruled that the prosecution’s actions denied Derrick a fair trial. The annual march is organized by several Texas and national anti-death penalty organizations, including Texas Moratorium Network, the Austin chapter of the Campaign to End the Death Penalty, the Texas Death Penalty Abolition Movement, Texas Students Against the Death Penalty, Texas Death Penalty Education and Resource Center, Kids Against the Death Penalty, the Texas Civil Rights Project, Amnesty International at the University of Texas, S.H.A.P.E Community Center, the Journey of Hope … from Violence to Healing, and Witness to Innocence.